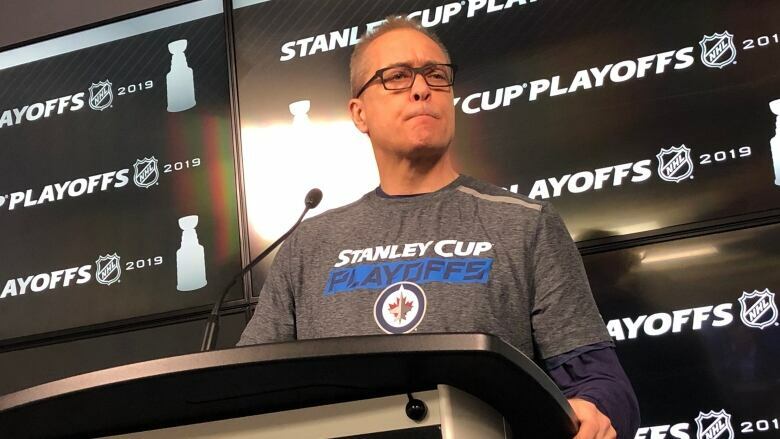 Winnipeg Jets coach Paul Maurice has a warning for anyone expecting the club to excel during the playoffs simply because they did well last year: Every team has to prove itself every postseason. Winnipeg opens the playoffs tonight at home against the St. Louis Blues. Both the Jets and the Blues finished the season with 99 points, but St. Louis had a stronger second half and is favoured by most oddsmakers and statistics experts. Maurice said Wednesday the Jets have spent three productive days watching video, are "excited to get going" and will not be overconfident simply because most members of this team were among the group that went to the third round of the playoffs in 2018. "Sure, playoff experience matters. You have veteran guys that know exactly what to expect and can elevate their game. But the collective is new each year and has to be proven over and over again," Maurice told reporters at Bell MTS Place following a morning skate. Maurice says every team has to prove itself in the playoffs, including the defending Stanley Cup champion Washington Capitals and the Tampa Bay Lightning, who ran away with the President's Trophy as the league's best team during the regular season. The Jets themselves are not expressing overconfidence heading into tonight's game against the Blues. "We know they're a solid team. They're definitely a different team than they were when we played them earlier in the year. They've worked hard at it," Jets centre Mark Scheifele said. "You've got to be prepared to grind out there." Jets forward Kevin Hayes, a trade-deadline acquisition, repeated the same observation his colleagues have been making all week: This is not the same St. Louis Blues the Jets beat three times last fall. "They've completely changed their game. They've kind of went from a skill team to working hard, and a gritty team. So we have to do the same to match it," Jets forward Kevin Hayes said. Tonight's game starts at 7 p.m.